IOGEAR's compact wireless keyboard gives you 33 feet of wireless freedom between you and your videos, photos, movies and online content. Its ergonomic design and built-in trackball makes it comfortable and easy to type, navigate and interact with your computer. 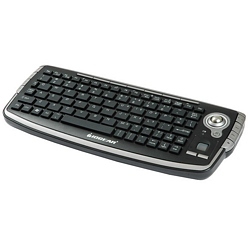 It works great with entertainment center PCs and Sony PS3® consoles, and can be used as a keyboard with the Xbox® and Wii® consoles. Includes USB wireless adapter and 2 AAA batteries. Requires USB keyboard-compatible PC or console.